8 p.m. is a little late to still be waiting on dinner, but I suppose when you cook every night, it ends up being that late anyway. Add onions, thyme, bay leaves, salt and pepper. Cook, stirring occasionally, until the onions are golden (not brown) and nearly melting, about 45 minutes. Stir in wine and simmer, stirring occasionally, until reduced by half. Stir in stock and simmer, stirring occasionally, for 15 minutes. 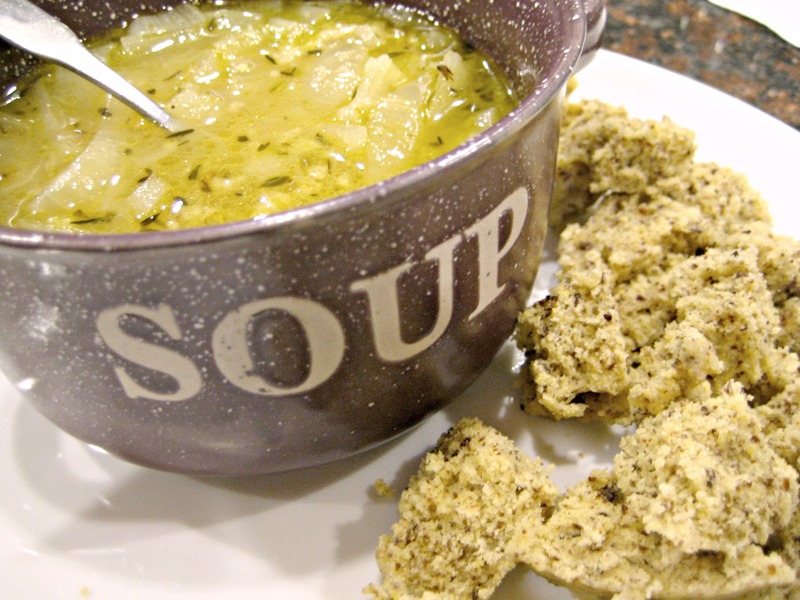 If using cheese, add allergen-gluten free bread (if desired) to an oven-safe bowl filled with soup and top with cheese. Melt using broil until cheese is melted. Careful not to burn. If not using cheese, use allergen/gluten-free bread for dipping on the side. Saute the Chicken Sausage (1 per bowl of soup) and add to the soup for a balanced meal and extra flavor! This entry was posted in Allergen-Free, Appetizer, Dinner, Lunch, Main Dishes, Sides, Soups and tagged allergen-free, french onion, fresh thyme, gluten-free, soup. Bookmark the permalink.